The results are in and, as was the case last year, rural Oregon once again won many more medals than Portland, the city with more breweries than any city in the world and arguably the most vibrant beer culture in the state. Of the 22 medals Oregon won at the festival, 15 went to breweries outside the Portland metro area. There's no reason to go off on a tangent about this like I did last year. Portland breweries (Breakside's Milwaukee brewery is included in the Portland count, if you're wondering) did better this year than last, when they won 6 of 25 medals...about 25 percent. This year's 7 of 22 performance translates to 32 percent. If you take a look at Oregon's medal count 2009-2013, as I did last year, 2014 numbers are a nice fit. During those five years, breweries outside Portland won 70 percent of the medals. That percentage dropped slightly this year, in line with a trend that has Portland's breweries doing slightly better in the medal race over the last three years. If you're hoping to find any deep meaning in these stats, don't look at me. I can't tell you how many Portland breweries submitted beers for judging, or how many rural breweries did. I do know, thanks to Geoff Kaiser and the Seattle Beer News, that Oregon as a whole submitted 286 beers and had a medal winning ratio of 7.7 percent, best in the country. Not to get too far afield, but a brief review of the overall stats is in order here. 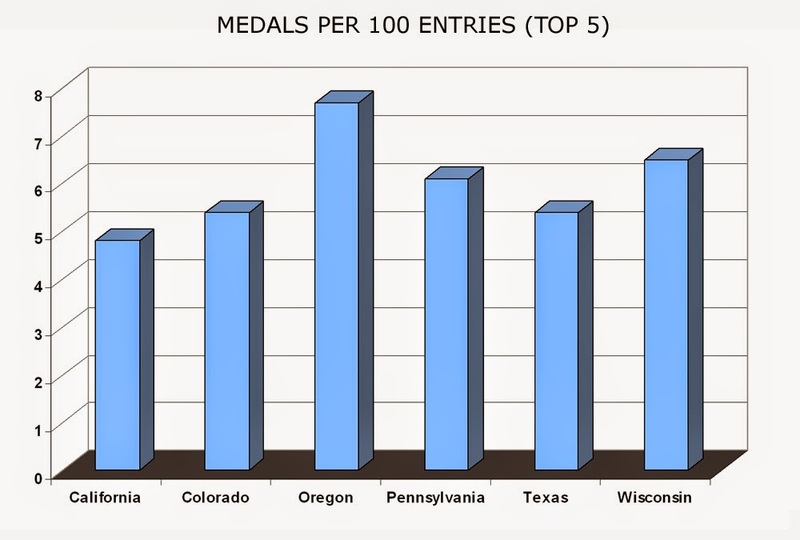 Some wonder why Colorado and California win so many medals. Well, it's partly because they make a lot of good beer. But there's more. Those two states submitted far more entries than anyone else...962 for California and 702 for Colorado. The closest competitors were Texas (288), Oregon (286) and Illinois (225). More entries doesn't automatically translate to more medals, but it does give you a greater number of chances to win. For its trouble, California won 46 medals, a batting average of 4.8 percent. Colorado won 38 medals, an average of 5.4 percent Texas, which is up and coming in craft beer, took home 16 medals and matched Colorado's winning percentage. Depending on your point of view and (likely) where you live, the more meaningful list is arguably the medal count per 100 submissions. That graphic (below) shows which states got the most bang per beer entered. 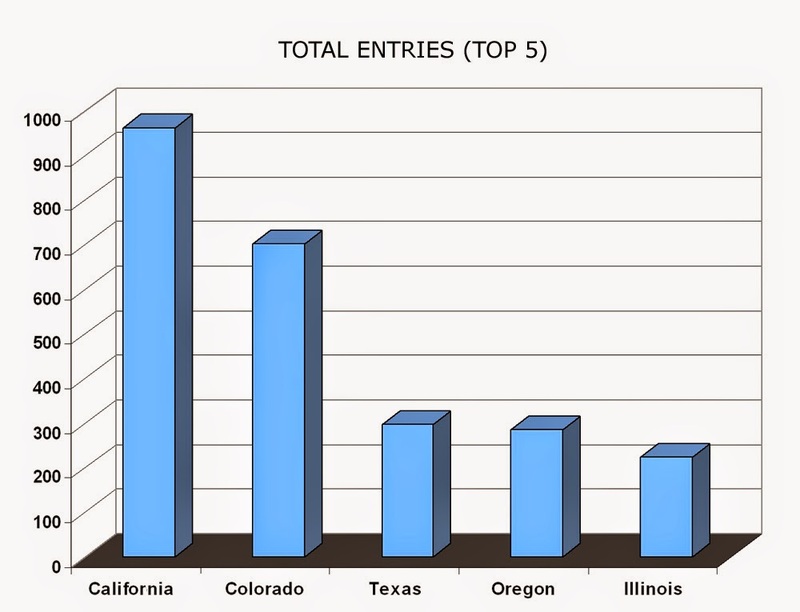 The top three are Oregon, Wisconsin and Pennsylvania, followed by Colorado and Texas (a tie) and, finally, California. It might be nice to know which breweries from the various states submitted beer to be judged. This is information the Brewers Association prefers not to divulge for obvious reasons. What you can do is sort through the page links on the GABF website until you find the list of Participating Breweries. Oregon had 32, if you're keeping track at home. Keep in mind that the list of Participating Breweries is not the same as the phantom list of those entering the judging. How do I know? Because several of Oregon's winners (Caldera, Gold Beach and 13 Virtues) do not appear on the Participating Breweries list. They submitted beers and won medals, but didn't pour their beer in the convention center. How many more fall into that category? No clue. 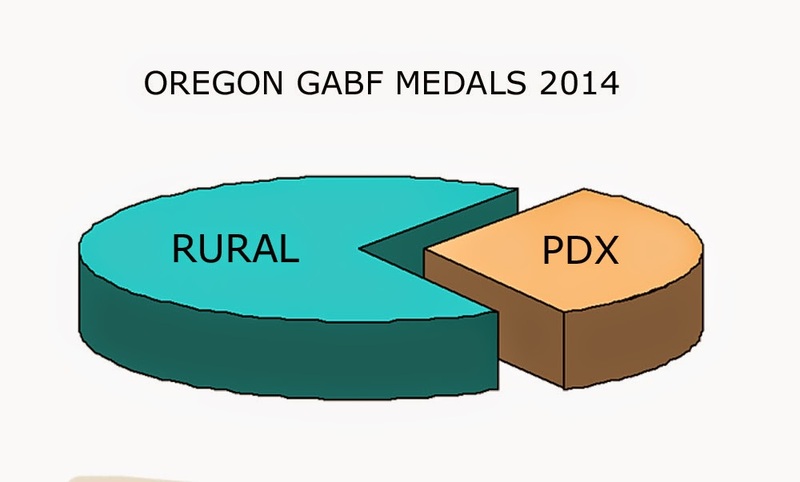 Getting back to the issue at top, the question of why rural Oregon seems to dominate the state's GABF medal count has been debated extensively. One prevalent thought is that Portland breweries have moved away from set style guidelines in an effort to satisfy a crazy beer culture that demands new and bizarre flavors. Rural breweries don't have to feed that monkey and are more likely to brew to existing styles. Thus, they tend to do well at the GABF. So another year of the GABF has come and gone. While the results are always interesting in some ways, I can't help hoping we will someday be a little less fixated on medal counts. There are thousands of great beers out there that have never won medals. Drink those wherever you find them.